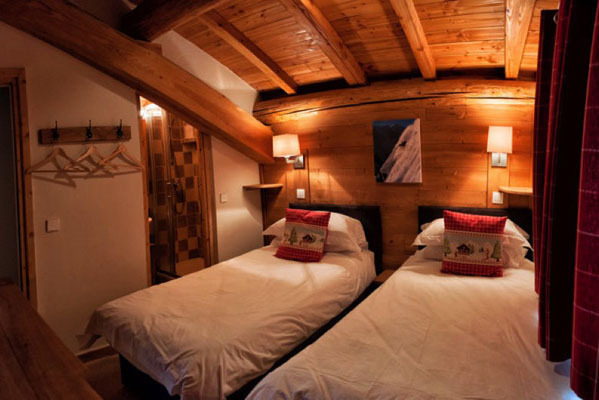 Chalet Arabette is a stunning luxury chalet in Tignes Les Brevieres at 1550m. It has a fantastic location with mountain views. 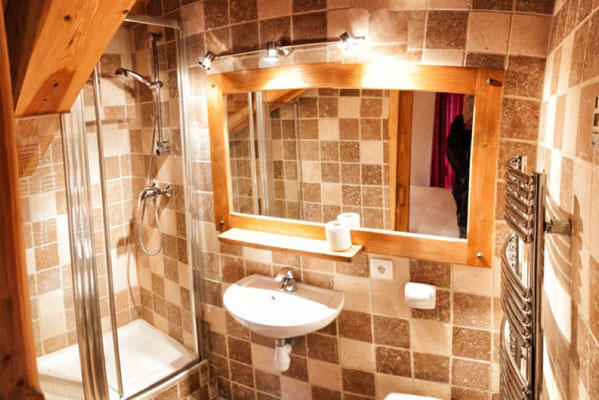 The chalet was refurbished to a high standard in summer 2013. 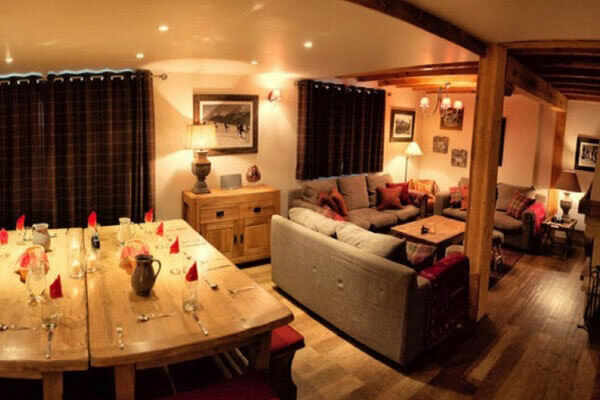 Sleeps 12 guests, 6 ensuite bedrooms, 6 showers, 1 bath, 100 metres to slopes, 100 metres to resort centre, delicious four course evening meals with wine, hot tub on terrace, log fire, free WIFI internet, UK TV, 2 lounges, 12 stay for price of 11. A beautiful open plan lounge and dining area with large dining table for 12 guests, log fire, 3 large comfortable sofas plus other seating. 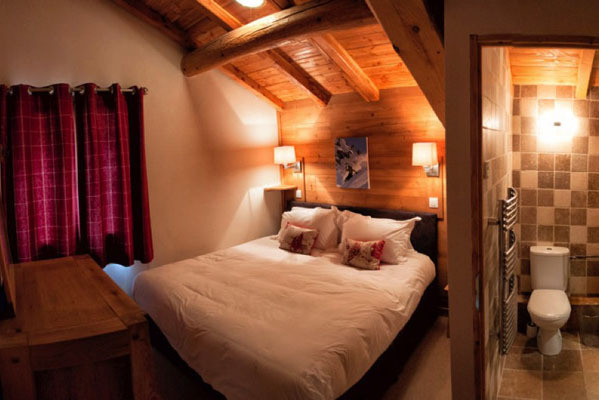 French windows lead onto the south facing balcony with hot tub and stunning mountain views. 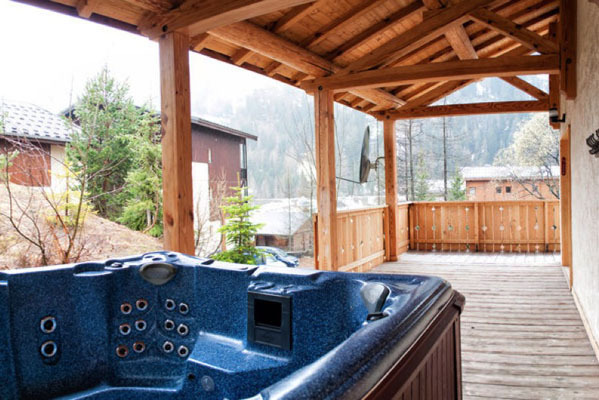 Enjoy the chalet hot tub after a great day of skiing – what better way to relax in such a beautiful mountain paradise? The terrace is equipped with outdoor table and chairs (sorry, not pictured) to bask in the winter sunshine. Large Master suite with super king size bed and beautiful ensuite bath and shower room. 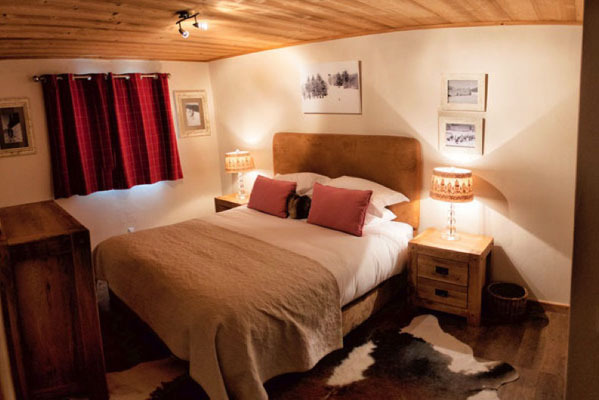 Tastefully furnished, bedside and overhead lighting, window with mountain views, underfloor heating, wardrobe, chest of drawers, mirror, cow hide rug. The largest of the bedrooms, a supplement applies when booked separately. On the ground floor. 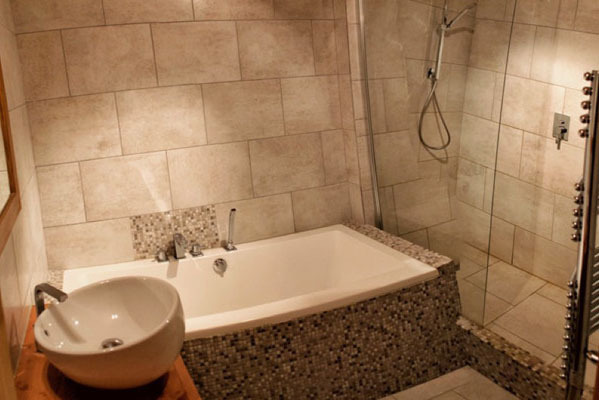 Ensuite Bath, spacious walk in shower, washbasin and toilet. Chrome towel radiator, underfloor heating, good lighting, large mirror, wood vanity unit, stylish tiling, soft bath sheets, hand towels. 2 single beds or 1 king bed with ensuite shower and washbasin. South facing window with mountain views, wall cupboards, shelves and clothes hanging hooks. Ensuite shower and washbasin with chrome towel radiator, soft bath sheets, hand towels. Separate toilet. 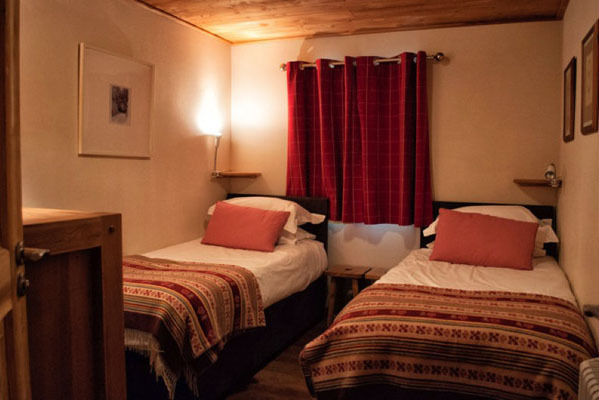 The smallest of the bedrooms, with a discount available when booked separately. On the ground floor. 2 single beds or 1 super king bed with ensuite shower, washbasin and toilet. South facing window with mountain views, underfloor heating, wall and bedside lights, chest of drawers, clothes hanging hooks. Ensuite shower, washbasin & toilet with chrome towel radiator, good lighting, mirror, stylish tiling, soft bath sheets, hand towels. On the ground floor. 2 single beds or 1 super king bed with ensuite shower, washbasin and toilet. French doors to South facing balcony with mountain views, underfloor heating, part wood panelled walls, adjustable wall lights beside beds, chest of drawers, clothes hanging hooks. On the 2nd floor. Ensuite shower, washbasin and toilet. Chrome towel radiator, underfloor heating, good lighting, large mirror, stylish tiling, soft bath sheets, hand towels. 2 single beds or 1 super king bed with ensuite shower and washbasin. Window with mountain views, underfloor heating, part wood panelled walls, wall lights beside beds, chest of drawers, clothes hanging hooks. Ensuite shower and washbasin. Chrome towel radiator, good lighting, mirror, stylish tiling, soft bath sheets, hand towels. Separate toilet. On the 2nd floor. 2 single beds or 1 super king with ensuite shower, washbasin and toilet. Window with mountain views, underfloor heating, part wood panelled walls, adjustable wall lights beside beds, chest of drawers, clothes hanging hooks. On the 2nd floor. 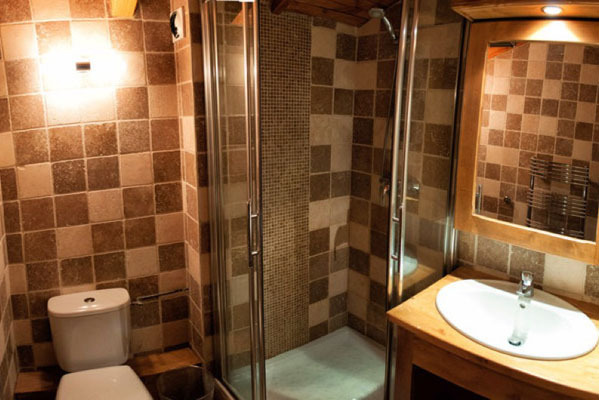 Ensuite shower, washbasin and toilet. Chrome towel radiator, underfloor heating, good lighting, large mirror, stylish tiling, soft bath sheets, hand towels. 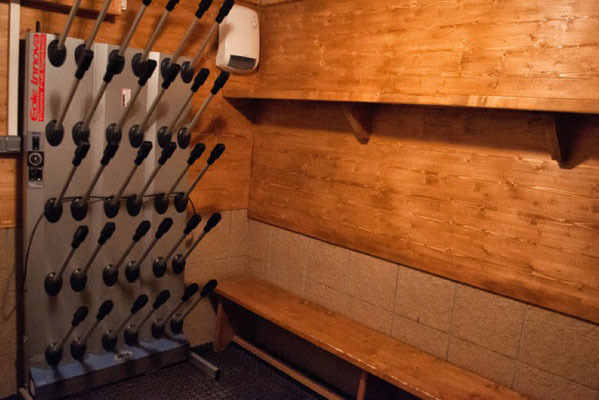 On the ground floor of the chalet is a convenient and well thought out room with rubber floors, hanging space and enough heated boot warmers for all guests for dry warm feet and secure storage of your skis, snowboards, boots and ski coats. Please enter any additional information you think may help us with your enquiry. 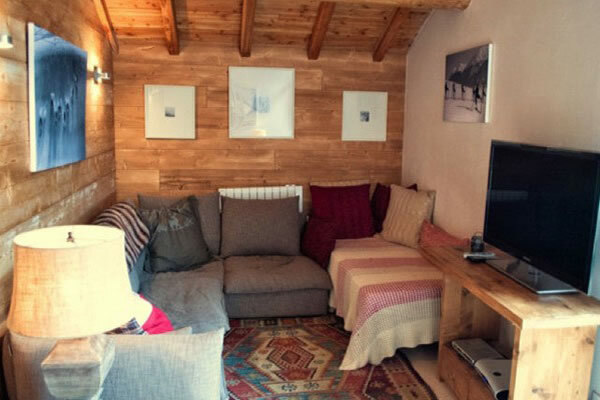 Note this Chalet is usually sold on a 7 night basis, Saturday to Saturday. 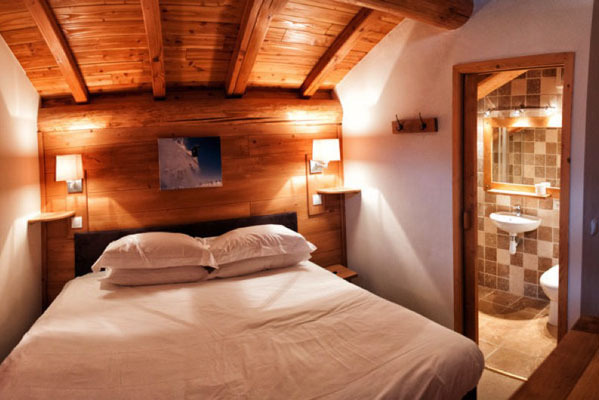 Chalet Arabette is situated in Tignes Les Brevieres at an altitude of 1550 metres. Although Tignes Les Brevieres is not quite as high as Tignes Le Lac and Tignes Le Lavachet (2100m), it is still a high altitude resort and has an excellent snow record. Thanks to it's altitude and the aspect of it's slopes, it has always been possible to ski from and back to the village from December to April for all of the 10 years we have been in Tignes. 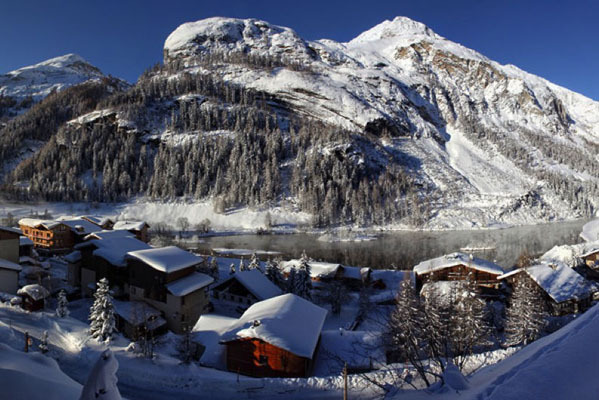 Tignes Les Brevieres is well linked with all the other Tignes resorts, and neighbouring Val D'Isère. 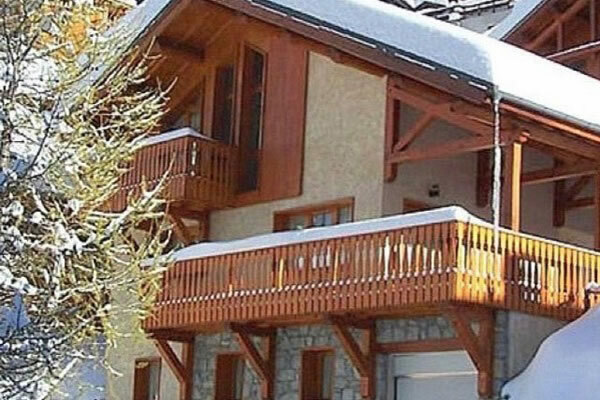 Chalet Arabette has a great location 150 metres from a short bubble lift on a monorail which takes you down to the main lifts and slopes at the foot of the beginner slope (Pitots), a blue slope (Myrtilles), a red slope (Pavot) and a black slope (the infamous Sache). A fast 6 person bubble lift (Sache) takes you to two chairlifts, both giving access to Tignes Le Lac via a blue slope (Rhododenron then Petit Col) or a red slope (Bluets). There is also a free 4 person chairlift (Brevieres) connecting with Tignes Les Boisses and a free beginner button lift (Pitots) serving the beginner slope. At the end of the day you can take the short bubble lift on a monorail from the main lift station to within 150 metres (a downhill walk) of Chalet Arabette. Tignes Les Brevieres is linked to other Tignes villages during the day by a free pedestrian chairlift (Brevieres) and a free resort shuttle bus, meaning non skiers can get around independently. 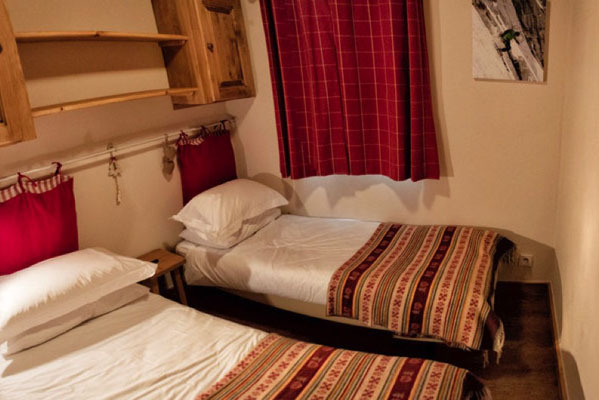 Chalet Arabette is 100 metres from the centre of Tignes Les Brevieres where you will find cafes, bars, restaurants, a supermarket, bakery, newsagents, post office, cash machine, tourist office, ski school and ski and snowboard shops.